Are you bored with wearing ponytails and using same old women’s hair care techniques? If so, don’t ditch this style just yet! There may be a solution to your boredom. Try glamming up your ponytail with some new, easy styles and hair styling tools. Here are ten eye-catching ways to style your pony! This style starts simple with using a hair straightener like iKONIC’s Persona. Then, fold one section over the back of your head, and bobby pin it there. Twist the other side toward the middle, and bobby pin it in place before tying it off with an elastic band. Finally, wrap the remaining hair around the hair tie and secure it with pins. In this style, two ponytails are better than one. Section your hair into top and bottom. Use a hair tie to tie the bottom into a ponytail. Tease the section near your forehead to get some volume at the top. Use another hair tie to put the top into a ponytail. Done right, this style layers the ponytails into a cascade of hair. This ponytail is probably the simplest, but it’s also one of the most stylish. All you have to do is divide your hair like you’re going to put it in pig tails. Then, tie the two sections into two knots. Lastly, use bobby pins to secure the knot. This style starts like the double pony. But when you tie back the top pony, make sure it’s a little loose at the top. Tease the ponytail just to get some volume, and then use a clip to smooth down the loose hair from the top pony. If you’ve only got a few minutes, but don’t want to settle for the standard ponytail, then this style is for you. 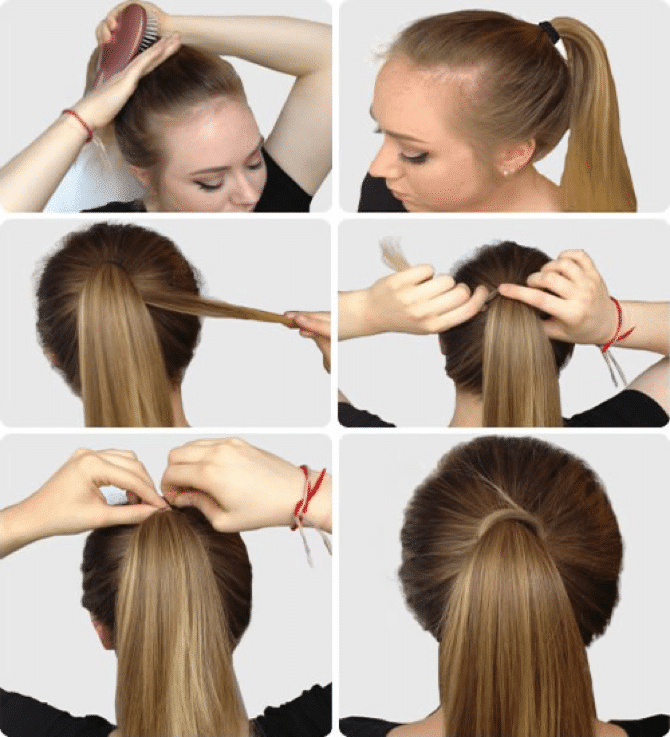 Just take a section of hair from underneath your ponytail and wrap it around your hair tie. It’s that easy! This is another simple style that will only take you minutes. Tease the top of your hair, and then pull it all back in a ponytail. Remember to allow the teased section to bunch up at the top to create the pompadour. At the end, use the hair wrap technique. This low side pony begins with a twist. Sweep your hair to one by twisting it over. Pin the twist in place. Use a hair tie to secure your hair, but leave out a section near the front to complete the style with a hair wrap. It’s best to start this style off with waves, and to use a headband. Then, tease your hair so it has some volume on the top when you pull it back in a ponytail. Loosen hair around the hair tie, and then continue to tease your hair. Once your hair is pretty big, put two small elastic bands around it spaced equally apart. If you really want to go all out, you could try the French braid ponytail. First, start a French braid at the top of your head. Be sure to keep a section out at the base of your neck for the final stage of the style. Next, tie the braid off once it reaches your neck. Then, braid the section that you left out, and secure it with a small elastic band. Finally, wrap the small braid around the hair tie that secures the French braid. To finish, pin the small braid in place. If you’re tired of the same old ponytail, these hair styles are sure to refresh your look. Try them all and see which ones are your favorites!